One of the greatest blessings one can receive from being a bearer of the priesthood … is belonging to a priesthood quorum. “Which church was organized and established in the year of your Lord eighteen hundred and thirty, in the fourth month, and on the sixth day of the month which is called April” (D&C 21:2–3). It was on this day that Joseph Smith, Oliver Cowdery, and members of the Smith and Whitmer families met in the home of Peter Whitmer Sr., in Fayette, Seneca County, New York. After appropriate song and prayers, the revelations concerning the organization of the Church were read to the assembled people. These revelations set forth the order of the priesthood and the duties of the officers in the Church. Following this pattern the Church organization of today has been built. “According to previous commandment, the Prophet Joseph called upon the brethren present to know if they would accept himself and Oliver Cowdery as their teachers in the things of the kingdom of God; and if they were willing that they should proceed to organize the church according to the commandment of the Lord. To this they consented by unanimous vote” (B. H. Roberts, A Comprehensive History of the Church, 1:196). And thus we have the pattern established in the very beginning. “And all things shall be done by common consent in the church, by much prayer and faith, for all things you shall receive by faith” (D&C 26:2). I find a special feeling surging through my whole being as I see the hands raised to the square to sustain the leadership of this Church. Today two new members of the Quorum of the Twelve Apostles were sustained by the members of the Church here in the Conference Center and by television, Internet, and satellite to almost all corners of the earth. Elder Uchtdorf and Elder Bednar, you have been sustained to fill the vacancies created by the deaths of Elder David B. Haight and Elder Neal A. Maxwell. As a member of the Quorum of the Twelve Apostles, I welcome you with open arms as you become part of this sacred calling which is ours. Of course, today we miss our association with Elder Haight and Elder Maxwell. Elder Haight has been sitting by my side in these conferences for the past 28 years. Elder Maxwell has been next to him for a number of years. How I wish I had the enthusiastic spirit of Elder Haight or the word power of Elder Maxwell to express my feelings about this long association I have experienced with these two great Brethren. They have added so much to my life. How I miss their continued association! We have a rich tradition of the work of the Twelve as we have traveled throughout the world proclaiming the gospel of Jesus Christ. For example, it was on Sunday, the 4th of June of 1837, that the Prophet Joseph Smith approached Heber C. Kimball in the Kirtland Temple and whispered to him, saying, “Brother Heber, the Spirit of the Lord has whispered to me: ‘Let my servant Heber go to England and proclaim my Gospel, and open the door of salvation to that nation’” (quoted in Orson F. Whitney, Life of Heber C. Kimball , 104). “September 14th, , President Brigham Young left his home at Montrose to start on the mission to England. He was so sick that he was unable to go to the Mississippi [River], a distance of thirty rods, without assistance. After he had crossed the river he rode behind Israel Barlow on his horse to my house, where he continued sick until the 18th. He left his wife sick with a babe only three weeks old, and all his other children were sick and unable to wait upon each other. Not one soul of them was able to go to the well for a pail of water, and they were without a second suit to their backs, for the mob in Missouri had taken nearly all he had. On the 17th, Sister Mary Ann Young got a boy to carry her up in his wagon to my house, that she might nurse and comfort Brother Brigham” (quoted in Life of Heber C. Kimball, 265). The Bible Dictionary states that Apostle “means ‘one sent forth.’ … The calling of an apostle is to be a special witness of the name of Jesus Christ in all the world, particularly of his divinity and of his bodily resurrection from the dead. … Twelve men with this high calling constitute an administrative council in the work of the ministry. … Today twelve men with this same divine calling and ordination constitute the Quorum of the Twelve Apostles in The Church of Jesus Christ of Latter-day Saints” (“Apostle,” 612). An Apostle today continues to be “one sent forth.” The conditions we face are different from those of the early Brethren as we make our journeys to fulfill our assignment. Our manner of travel to all corners of the earth is very different from that of the early Brethren. However, our assignment remains the same as that which was given by the Savior as He instructed His called Twelve to “go ye therefore, and teach all nations, baptizing them in the name of the Father, and of the Son, and of the Holy Ghost: teaching them to observe all things whatsoever I have commanded you: and, lo, I am with you alway, even unto the end of the world” (Matt. 28:19–20). For you two new Brethren, I can promise you that there will be a new understanding of what it means to belong to a quorum. I wish the feeling and respect we have for our Council could be transported to every quorum in the Church. Would you deacons, teachers, priests, elders, and high priests quorums listen for a moment to what I believe is one of the greatest blessings one can receive from being a bearer of the priesthood? That special blessing is belonging to a priesthood quorum. “The genius of our Church government is government through councils. … I see the wisdom, God’s wisdom, in creating councils: to govern his Kingdom. In the spirit under which we labor, men can get together with seemingly divergent views and far different backgrounds, and under the operation of that spirit, by counseling together, they can arrive at an accord. … I have no hesitancy in giving you the assurance, if you will confer in council as you are expected to do, God will give you solutions to the problems that confront you” (in Conference Report, Oct. 1953, 86). And what are the great benefits you will experience from belonging to a quorum? Again from Stephen L Richards. He said, “A quorum is three things: first, a class; second, a fraternity; and third, a service unit” (in Conference Report, Oct. 1938, 118). I see this genius so manifestly apparent in the functions of the Quorum of the Twelve Apostles. We are a class as we study the doctrines of the kingdom together. 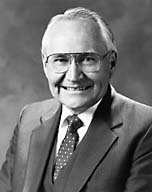 Can you imagine what a special experience it would be to be in a quorum meeting and be taught gospel doctrine by Elders Ezra Taft Benson, Mark E. Petersen, LeGrand Richards, Howard W. Hunter, Bruce R. McConkie, David B. Haight, or Neal A. Maxwell? You will notice that I have used only those Brethren who have completed their earthly ministry in order not to be selective among our current Apostles. This same blessing can be yours in each of your quorums. The words of the Apostles, past and present, live in the scriptures, conference addresses, Church magazines, devotionals, and so forth. They are available to bring the power of the doctrine of the kingdom into your quorum’s class. Make of your quorum a class to increase your knowledge of the gospel of our Lord and Savior. In our Quorum, we have a special brotherhood. We are there to lift, inspire, and bless each other with the spirit of our calling. When one is burdened, there are 11 others anxious to help lift and share that burden. At times we rejoice together in feelings of accomplishment. We weep together in times of sorrow. We never feel as if we are facing a problem alone! There is always the counsel, support, help, and encouragement of our Quorum members. From the book Priesthood and Church Government, we have this statement on the brotherhood which should exist in every priesthood quorum: “The Priesthood is a great brotherhood, held together by the eternal and immutable laws that constitute the framework of the Gospel. The feeling of brotherhood should permeate the quorum. It should be the first concern of a quorum to help all members who may be in need temporally, mentally, or spiritually. The spirit of brotherhood should be the directing force in all the plans and operations of the quorum. If this spirit be cultivated, wisely and persistently, no other organization will become more attractive to the man who holds the Priesthood” (Rudger Clawson, foreword to A Guide for Quorums of the Melchizedek Priesthood , 3; quoted in John A. Widtsoe, comp., Priesthood and Church Government , 135). We would encourage each priesthood quorum in the Church to cultivate such a brotherhood. Finally, the only purpose for our Quorum is to be of service. Perhaps our deep feelings of this responsibility could be characterized in an epistle dated October 26, 1886, by Wilford Woodruff, who was then serving as President of the Council of the Twelve Apostles: “I will say to the Apostles, our responsibility is very great. … What manner of men ought we to be? The whole earth is ripening in iniquity, and the Zion of God should be prepared for the coming of the bridegroom. We should humble ourselves before the Lord and be in a position to be filled with the spirit of our calling, with the Holy Ghost, and with the revelations of Jesus Christ, that we may know the mind and will of God concerning us, and be prepared to magnify our calling and bring to pass righteousness, and be valiant in the testimony of Jesus Christ to the end. … There never was a time when the work of God required a more faithful testimony and labor from the Apostles and Elders than to-day” (“An Epistle,” Deseret News, 24 Nov. 1886, 712). Make of each of your quorums a great service organization for the benefit of all your quorum members. “Wherefore, now let every man learn his duty, and to act in the office in which he is appointed, in all diligence. “He that is slothful shall not be counted worthy to stand, and he that learns not his duty and shows himself not approved shall not be counted worthy to stand” (D&C 107:99–100). And so I say to you two Brethren who have joined us in our Quorum, and to all of you brethren who belong to the priesthood of God, may God bless each of us in our calls to serve. May our faith strengthen as we serve in righteousness, faithfully keeping the commandments. May our testimonies ever grow stronger as we seek to find the fountain of eternal truth. May the brotherhood that exists in our quorum be of comfort and strength and security as we pass through this mortal part of our existence. May the joy of gospel service ever abide in our hearts as we go forward to fulfill our duties and responsibilities as servants in our Father in Heaven’s kingdom, is my humble prayer in the name of Jesus Christ, amen.